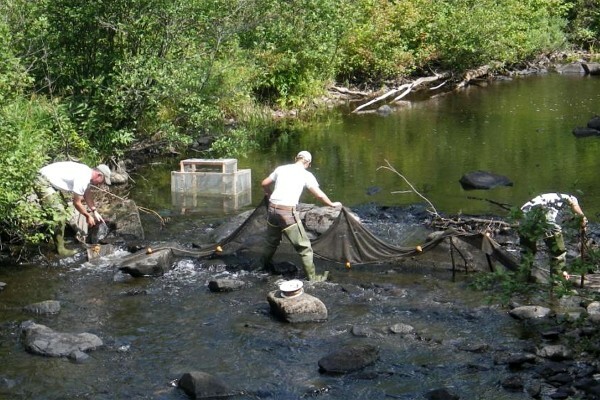 Crews electrofish an area of the Roach River in August 2014 to study the impact of fish affected by errors made by a contractor for the Appalachian Mountain Club during work on the dam. Pumps were placed next to Second Roach Pond to bring water into the Roach River after a stretch of the river that serves as a "nursery" for wild brook trout and landlocked salmon was found to be dry after errors were made by a contractor for the Appalachian Mountain Club during work on the dam. 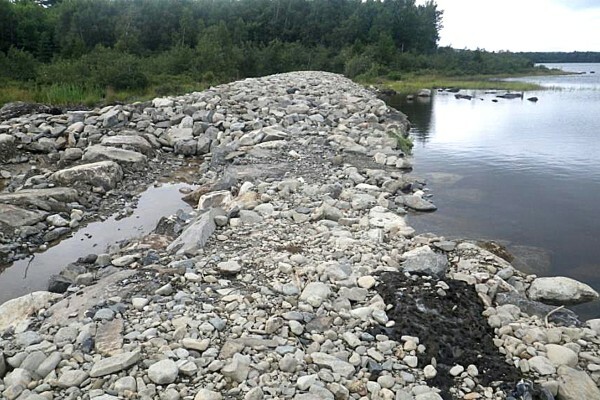 This photo shows the dam on the Roach River that caused a stretch of the river that serves as a "nursery" for wild brook trout and landlocked salmon was found to be dry after errors were made by a contractor for the Appalachian Mountain Club during work on the dam. TOWNSHIP 1 RANGE 12 — A prime wild salmon and brook trout habitat was accidentally destroyed in August when dam construction on land owned by the Appalachian Mountain Club left about a mile stretch of the Roach River without water for a 10-day period. 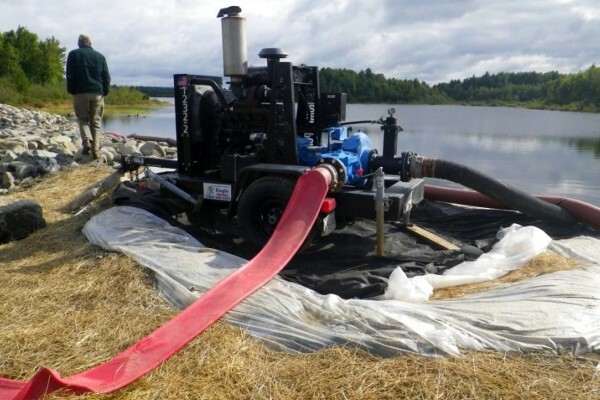 The dewatering of the river, as this situation is known, triggered a notice of violation against the club by Maine’s Land Use Planning Commission, a copy of which was obtained by the Bangor Daily News. Among the ecological consequences, according to fisheries biologists, the vast majority of two year classes of wild landlocked salmon and brook trout — those that naturally hatched in the river last year and those that hatched this year — were lost. Tim Obrey, regional fisheries biologist for the Maine Department of Inland Fisheries and Wildlife, said he and fisheries specialist Steve Seeback went to the stretch of river between First Roach and Second Roach ponds — about 20 miles northeast of Greenville — Aug. 18 after being told by a camp owner the river essentially was dry. That section of the Roach River is viewed as essential nursery habitat for young fish. Another stretch of the river, from First Roach Pond to Moosehead Lake, is a popular fly-fishing destination. Obrey said fish in that stretch were unaffected by this incident, and he doubts fish from the upper stretch of the river drop down to populate the fishing portion of the river. Therefore, anglers on the Roach should see little change. The pond level did not rise to an adequate level, however, and the river was left without any flow from Second Roach Pond for 10 days. The Appalachian Mountain Club and planning commission said they hope to resolve the problem through an administrative settlement agreement, though the commission’s notice of violation does state “more rigorous enforcement remedies” are available, should a settlement not be reached. Graff, of the club, said the dam was rebuilt after an extensive permitting procedure, during which the Land Use Planning Commission and the Army Corps of Engineers vetted the project. Over a 13-month span, according to Graff, the water level of Second Roach Pond — the body of water that would be held back by the rock-rubble dam — was measured. A drier than normal summer may have contributed to the situation that developed, Graff said. Graff said there were no Appalachian Mountain Club employees at the site to monitor the river level. The club’s cabins at the remote site have not been in operation since 2012, and the group is in the process of obtaining permits to rebuild cabins there. The day after being notified by the DIF&W of the situation, the club began pumping water from Second Roach Pond into the river. That pumping effort continues. Nick Livesay, executive director of the Land Use Planning Commission, met with Graff and DIF&W officials last week to formulate a plan. Livesay said there are two key concerns on which his group is focusing. First, develop a short-term solution to ensure there is enough water for spawning salmon that will swim into the Roach River from First Roach Pond during this month. To that end, the parties are planning to install two culverts under the dam to allow more water into the river. Second, the planning commission wants to ensure that the dam is properly operated in the future so appropriate water levels are maintained. Among the commission’s “corrective actions required” was a requirement the club employ a separate engineer — approved by the Land Use Planning Commission — who would confirm the post-construction pond level and river flow are acceptable. Obrey said the club has been cooperative since it was notified of the problem, and Graff said he expects his group to continue to cooperate with the commission and DIF&W. Graff said the Appalachian Mountain Club has a history of trout stream restoration and thought adding fish passage while repairing the dam would have a positive impact on the river.